Oshkosh Corporation, a designer and manufacturer of specialty vehicles, has made 15 acquisitions since 1996. While they’ve experienced great growth, they’ve been left trying to consolidate multiple service desks and other disconnected IT tools. 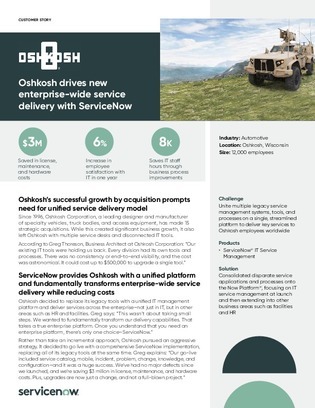 Access this case study to find out how Oshkosh was able to consolidate their legacy tools into a single unified IT management platform, and save $3 million in license, maintenance, and hardware costs alone.